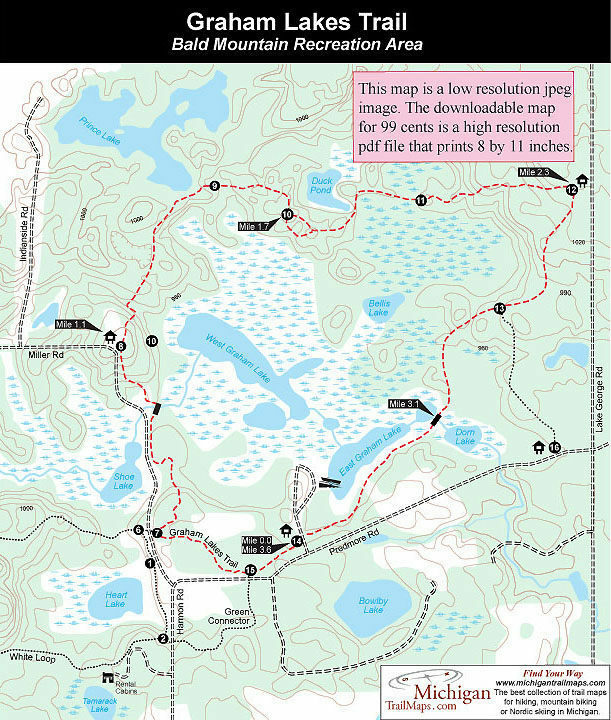 Bald Mountain Recreation Area has 15 miles of trails divide between the North Unit and the South Unit and the crown jewel of the system is the 3.6-mile loop around Graham Lakes. Officially it’s labeled the Orange Loop but it’s commonly referred to as the Graham Lakes Trail. The loop was originally built in 1983 as a Nordic trail because the hilly unit seemed like a natural one for cross-country skiing with its numerous long, downhill runs. But this lake-studded area also attracted the attention of hikers and eventually mountain bikers. At the East Graham Lake a large wooden display sign and post No. 18 marks where the trail crosses the road to the DNR access site and parking area. The trail is numbered in a clockwise direction thus heading west you quickly pass post No. 19, marking the junction of the Green Connector, a half-mile spur that crosses Harmon road to the White Loop. In 0.4 mile from the start you reach post No. 9, where the Yellow Connector hops across Harmon Road to reach the White Loop within a 100 yards. Graham Lakes Trail continues north where it descends to the remnants of an old two track to West Graham Lake and climbs the best hill of the day. On the way up, you pass a view of Shoe Lake and then breakout at a clearing where there is a bench and a view of West Graham Lake and many of the surrounding ridges you'll walked over on the backside of the loop. 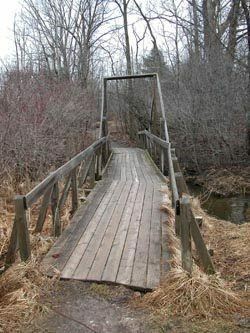 You then descend to skirt Harmon Road and cross an impressive wooden bridge over a stream that flows between Shoe and West Graham lakes. Graham Lakes Trail swings away from the stream, climbs another hill and 1.1 miles from the start reaches post No. 10 at the north end of Harmon Road, coming within view of one of the few private homes seen along the way, a rather amazing fact for this rapidly developing region of Oakland County. You leave the post hiking in a northeast direction and enter a pine plantation whose trees are in perfect rows and tower above a bench. From here it’s only 0.2 mile until you arrive at the end of Prince Lake, 1.5 miles from the start. Occasionally you’ll see anglers on the water targeting panfish and largemouth bass as the lake has a boat launch on its west end. Graham Lakes Trail now swings to a more easterly direction and soon passes a view of Duck Lake, a marshy pond that is surrounded by cattails and deadheads. Post No. 12 is reached 1.9 miles from the start and marks where a skiers' bypass has been built. A bench has been placed here as the hill serves as an overlook with Duck Pond to the north and the surrounding hills to the west. The bypass quickly rejoins the main trail at post No. 13 and the next quarter mile is mostly downhill to post No. 14, where you pass another view of Duck Pond and then bottom out at a marshy where there may or may not be a sluggish creek. Graham Lakes Trail quickly leaves the wetland as it steadily climbs a long hill to reach post No. 15, within a 0.3 mile. The post and map serves as a trailhead for a parking area off Lake George Road. Follow the trail as it swings south (right) and follows a steady route downhill, losing 50 feet by the time it arrives at post no. 16, marking a spur from Predmore Road. You’re now less than a mile from the access site. More hills follow until you bottom out at a large wooden bridge over a stream that flows from marshy Dorn Lake, a gathering spot for waterfowl in spring and fall, to East Graham Lake to the north. The bridge makes a nice place to enjoy the wetland scenery. Within a half mile or 3.6 miles from the start of your trek you return to your vehicle.